Shaxi Guangzhou international hotel supplies City (formerly known as Guangzhou Shaxi commercial city) is the largest hotel supplies, home kitchen supplies and equipment distribution center, located in the South China Expressway exit Shaxi Guangzhou Panyu Bridge, close to Welcome Road, Sunbeam Road, Beijing-Zhuhai Expressway, 105 State Road, Metro Line exit, traffic in all directions. Adjacent Chinese Export Commodities Fair, Island Pavilion, spring and autumn of each year a number of trade fairs and specialized exhibitions in Guangzhou international hotel supplies City Shaxi business opportunity for manufacturers to provide international trade. Shaxi Guangzhou international hotel supplies City currently covers an area of ​​120,000 square meters, more than 1,000 existing shops, the financial institutions, catering, logistics and other support services is complete, many local and overseas manufacturers have set point in this business, a market-oriented adequate supply. In 2004, the market won the National Organizing Committee for the construction of market integrity, "quality, service integrity demonstration units" glorious title. Shaxi International Hotel in Guangzhou City, mainly engaged in varieties of products: ceramic tableware, glassware, linen restaurant, catering supplies, hotel supplies, kitchen equipment, stainless steel products, cleaning supplies, hardware, appliances, bedding and so on. 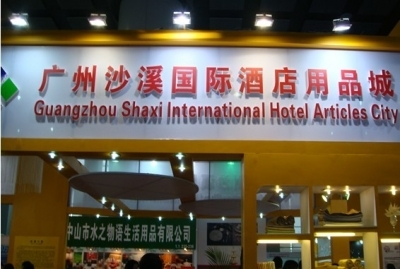 Shaxi International Hotel in Guangzhou to build China's hotel supplies City, supplies, home kitchen supplies and equipment for the professional wholesale brand-centric goals. Through the exhibition, e-commerce, trade associations actively promote, strengthen exchanges and cooperation with domestic and foreign large purchasing groups, for businesses to provide fast and accurate business information to broaden the field of buying and selling. With intelligent management system to further improve the soft services facilities and the continued strengthening of comprehensive strength, Guangzhou international hotel supplies City Shaxi wholesale "carrier" will be world famous! Guangzhou international hotel supplies City Shaxi warmly welcome home and abroad to visit, negotiate cooperation and common development, create a better future!